The supernatural community in Bon Temps, Louisiana, is reeling from two hard blows: the natural disaster of Hurricane Katrina and the manmade horror of the explosion at the vampire summit in the up-north city of Rhodes. Sookie Stackhouse is safe but dazed, and she's yearning for things to get back to normal. But that's just not happening. Too many vampires - some friends, some not - were killed or injured, and her were-tiger boyfriend Quinn is among the missing. It's clear that things are changing, whether the weres and vamps like it or not. And Sookie, Friend to the Pack, blood-bonded to the leader of the local vampire community, is caught up in those changes. She's about to find herself facing danger and death and, not for the first time, betrayal by someone she loves. And when the fur has finished flying and the cold blood has stopped flowing, Sookie's world will be forever altered. Despite the additional complications to Sookie's life, I still enjoyed the humour sprinkled all over. I think that Charlaine Harris was "spring cleaning" characters and getting rid of unattached or unnecessary strands in the story. Johanna Parker's reading was superb as usual and very entertaining. 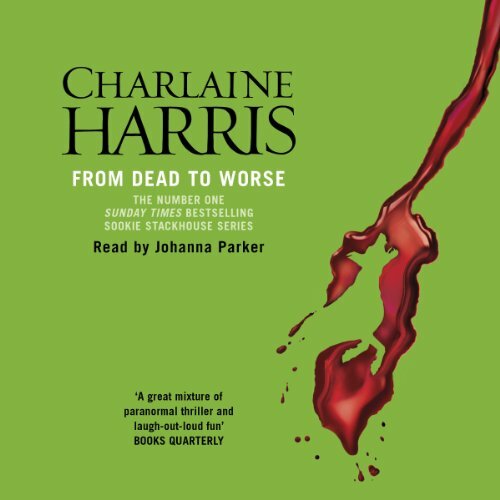 I have listened to the other audiobooks in the series prior to this one except "Altogether Dead" (I think it's geographically unavailable in my region), and have been happy with the quality of the audio recording. Unfortunately, I am unable to say the same of this one. There are some skipping in the audio (in both parts of the audiobook). However, I didn't find it annoying enough to stop listening. There is lot of battles and war. Still this is Sookie Stackhouse and if you love her you will also love this book. Not because it's boring - oh no - but because I could not come to terms with Sookie's love-related decisions. Actually this one particular that she takes near the end of the book. It bothered me so much that I even had to stop listening as I felt a great dislike toward Sookie for a few days. Oh, well, she's not a real person, eh? Besides, I have a feeling the author simply wanted to make room for ... well, you'll see. Another thing is the plot related to the new relative of hers she meets. Sorry, this was plain boring for me but, as I see it, this is an introduction to what happens in the next book. Finally, I confirm - the audio quality is poor. Very poor. Maybe in other formats it's better.